PSG allows to perform operations remotely by employing a versatile online Application Program Interface (API). The API operates by sending a configuration file to the PSG servers, that can modified on the local machine as needed. Upon reception of the configuration file, PSG will compute the spectra and send back the planetary spectra. The great value of the API is that the user does not need to install / update the radiative transfer modules and databases on his/her computer, and by simply performing a 'curl' command, the user will run the simulations on high-performance NASA servers. The configuration file is a relaxed form of XML (eXtensible Markup Language), the now preferred file type across applications. The spectra is provided in standard ASCII columns. The resulting units for the columns can be defined with the configuration XML file, while which type of data to provide (e.g., radiance, transmittance, noise) is provided by a POST command. The communication with the server is performed via HTTPS, and this can be implemented via the 'curl' terminal command. A single line of 'curl', in which the user inputs are provided via a config.txt (example) will lead to spectra. The figure below better explains the inner workings of the PSG modules, and how the user can enable / disable the different modules, and request for different spectral outputs. Application Program Interface: PSG can be called from a local machine via the 'curl' command that employs the HTTP protocol for establishing the communication between the local machine and the PSG servers. The user sends a XML configuration file, and receives different type of spectral results (str, tel, srf, trn, atm, rad, noi), all standarized as text ASCII tables. The API will call the required modules (geometry, atmosphere, continuum, pumas/cem, generator) in a sequencial order, yet the user can also enable / disable modules as needed. Examples are presented in the next section. In order to compute spectra, one first needs to create / modify a PSG configuration file. The user can choose to edit this file with any text editor or scripting language. 1) Obtain a template configuration file (e.g., config.txt). The easiest way to obtain a configuration file is by parameterizing PSG via the web interface until a desired spectrum is obtained. On the main page of PSG, then click on "Download config-file", this will download the XML configuration file. A generic template can be also downloaded here. 2) Modify the config.txt configuration file using a text-editor, or using any scripting / programming language. In order to better understand what each parameter means, please refer to the PSG documentation. The user can install and run a local version of PSG via the Docker system. PSG is a complex suite of spectroscopic models and databases, coordinated by a general radiative-transfer scheme. Installing the whole suite on a personal system can be a daunting process and would entail a great deal of resources / memory / time. By employing the Docker virtualization system, the user can easily install a pre-configured Virtual Machine with PSG that provides web/API access as the normal PSG suite. In order to provide flexibility, the PSG personal suite is organized in packages. By default, the personal suite of PSG comes with the PROGRAMS and BASE packages, yet the user can install many additional packages, expanding the capabilities of the local version. Specifically, the correlated-k tables for low/moderate spectral resolutions can be quite heavy, and should be installed only when strictly necessary. The local PSG site also keeps track of any updates of these packages with respect to the current PSG suite, and it will inform you if you are required to update the packages. PSG can run in any personal computer (Mac, Linux or Windows based) with the Docker software. Docker containers wrap up software and all its dependencies (including the operative system) into a standardized package that includes everything it needs to run: code, runtime, system tools and libraries. This guarantees that PSG will always run the same and Docker makes its installation as simple as pulling a container image. This also means that PSG can be easily deployed in cloud computing environments (e.g., Google Cloud, Amazon Web Services). 1) Install the Docker application in your computer. This is relatively easy and it will establish a virtualization system in which PSG will run. Visit the Docker site at www.docker.com. docker stop psg Stops the current PSG container. docker restart psg Restarts the PSG service. docker start psg Starts the PSG service if stopped. docker rm psg Removes the current container of PSG from docker memory. This operation deletes all updates/installed packages since its initial run, and resets PSG. docker ps -a Lists the status (e.g., stopped, started, exited) of all currently available containers. Containers cannot be re-run if they have already been created and therefore appear in this list (independently of the status). Restart if necessary, while if the user wants to reset PSG to its original image, remove the container (docker rm) and re-run it (docker run). docker image ls Lists all the available docker images. The user can spawn multiple instances/containers from the same image. When the user pulls the PSG image from the docker hub, then this image will appear in this list. docker image rm psg Deletes the PSG image from memory. Any new PSG container/instance will require a re-pull of the image from the docker hub. docker system prune -af Deletes all images and containers/instances from docker memory, fully resetting docker. Operational software and programs required by PSG. This package includes all the necessary binaries to perform the radiative transfer calculations and retrievals, together with the PHP server interpreter modules. 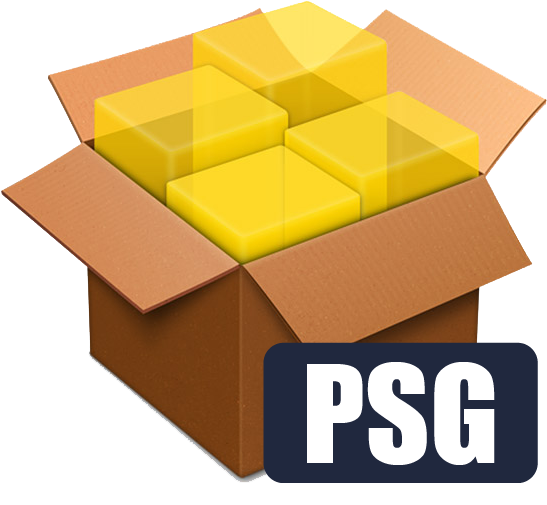 This package cannot be removed (it is fundamental for the operation of PSG), and it should be constantly updated to reflect the upgrades performed to the suite. HITRAN line-by-line database formatted for PSG (binary) with collissional information for CO2, H2, He when available. HITRAN Collission-Induced-Absorption (CIA) database for many species due to various collisionally interacting atoms or molecules. Some CIA spectra are given over an extended range of frequencies. UV cross-sections database for a multiple species (ingested automatically by the RT modules when applicable). 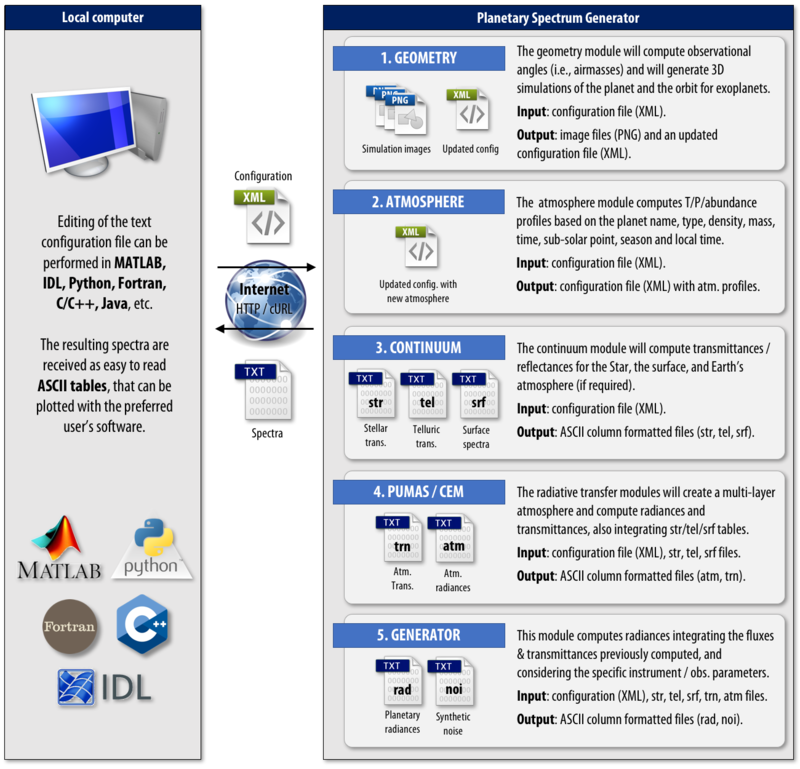 The surface spectroscopic package includes the complete repository of optical constants and reflectances from all databases handled by PSG (e.g., USGS, JENA). Atmospheric templates for most Solar-System bodies. Earth MERRA2 auxiliary data (e.g., topography) and Mars LMD climatology database. Exoplanet Parmentier T/P model and Kempton equilibrium chemistry modules. Exoplanet Terrestrial LAPS model (Turbet+2015). Ephemerides information for hundreds of Solar-System bodies (1960-2050). Ephemerides information for dozens of planetary missions (e.g., Cassini, MAVEN). Database of telluric transmittances pre-computed for 5 altitudes and 4 columns of water for each case. The altitudes include that of Mauna-Kea/Hawaii (4200 m), Paranal/Chile (2600 m), SOFIA (14,000 m) and balloon observatories (35,000 m). The water vapor column was established by scaling the tropical water profile by a factor of 0.1, 0.3 and 0.7 and 1. This package contains hundreds of absorption cross-sections for complex volatiles as reported by the latest HITRAN release. This package contains line-by-line spectroscopic information from several databases. This package contains non-LTE fluorescence efficiencies for dozens of species, suitable when synthesizing cometary spectra in the UV/optical/IR range. This package contains molecular and atomic cross-sections applicable for exoplanetary modeling, and it is based on the database employed by the open source 'Exo-Transmit' code (Kempton et al. 2017). This package contains correlated-k tables for the main HITRAN species (H2O, CO2, O3, N2O, CO, CH4, O2, SO2, NO2, NH3, HCl, OCS, H2CO, N2, HCN, C2H2, C2H4, PH3, H2S, C2H4, H2), and for different collissional partners (e.g., CO2, H2, He) when available. The tables were computed with PUMAS assuming wings of 25 cm-1 and a fine core of 1 cm-1 where maximum resolution calculations are applied. This is the 'low' resolution package applicable to synthesis of spectra with a resolving power lower/equal than 500. This is the 'med' resolution package applicable to synthesis of spectra with a resolving power greater than 500 and lower/equal to 5000.
rad Integrated fluxes, incorporating all planetary and stellar transmittances, and considering the specific instrument / observatory parameters. This file is computed by the module generator. This is the default output setting. noi Synthetic observational noise, including the noise introduced by the planet itself, its star (if present within the field), background sources (e.g., exozodii, local zodiacal dust, CMB), the terrestrial atmosphere (if observing from ground), and the instrument performance. This file is computed by the module generator. trn Integrated planetary transmittance spectra, including all geometry considerations and requested atmospheric parameters. This file is computed by the module PUMAS only. atm Integrated planetary fluxes as observed at the planet in units of [W m-2 sr-1 um-1]. This file is computed by the modules PUMAS and CEM. str Stellar transmittance spectrum. This file is computed by the module continuum. tel Terrestrial transmittance spectrum. This file is computed by the module continuum. srf Surface reflectance and emissivity spectra. This file is computed by the module continuum. cfg The API will return the updated configuration file. This file is computed by the modules geometry and atmosphere. all This keyword will return all the resulting spectra, and the configuration file. wgeo The geometry module computes the observational angles (GEOMETRY-SOLAR-ANGLE, GEOMETRY-OBS-ANGLE) and the beam/planet ratio (GEOMETRY-PLANET-FRACTION) employing the geometry information provided by the user in the XML configuration file. For exoplanets, it also computes the planet transit factor (GEOMETRY-STAR-FRACTION), and the planet-star distance (GEOMETRY-STAR-DISTANCE). This information is then saved into the configuration file to be used by the other modules. The default is wgeo=y, yet one can disable this computation with wgeo=n. wephm=y computes ephemeris for the date provided. wephm=N computes ephemeris for the current date/time. wephm=T for exoplanets, it searches the next primary transit event, while for Solar System bodies it computes the ephemeris for [date - one day]. wephm=S for exoplanets, it searches the next secondary transit event, while for Solar System bodies it computes the ephemeris for [date + one day]. wephm=P for exoplanets, it searches the next periastron event. wephm=n disables the ephemerides module (default). watm This keyword enables / disables the atmosphere module - Default watm=n. whdr This keyword allows to disable outputing the header information - Default whdr=y.